Fun and simple! This is a great gift! You can use it as a decoration at the shower. All diapers are 100% usable. Diaper Bear includes 35 Parent's Choice diapers size 1 (8-14 lb. ); Bib that say "I'd rather be at GRANDMA's"; Pacifier; Baby socks 0-3 month by carter's; Baby mittens; Pink Curly ribbon. Comes wrapped in cellophane with coordinating ribbons and bows. 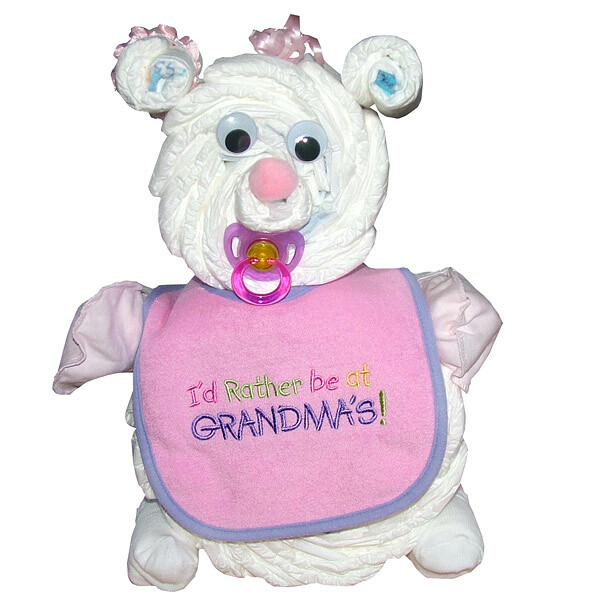 All our diaper bears made of highest quality ingredients with greatest care and love. Everything included is ready to use and easy to disassemble.